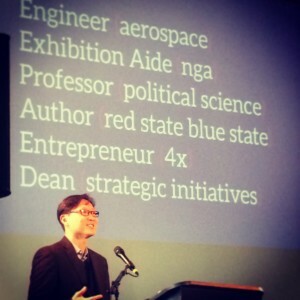 Dr. Park is Dean of Strategic Initiatives at Columbia University. Dr. Park is a member of Columbia University’s Institute for Data Sciences and Engineering New Media Center, Director of Special Projects at the Applied Statistics Center and Fellow at the Center for the Management of Systemic Risk at Columbia University. Dr. Park is also a founding member of Columbia University’s Digital Storytelling Lab and on the Board of Directors at Eyebeam. Dr. Park has co-founded several technology companies including HiTCH, a New York based technology company rethinking search. He is currently exploring the historical arc of universities, limitations and possibilities of “big data”, how ignorance, failure and vulnerability are the foundations of knowledge, innovation and creativity across organizations, as well as the electoral origins of US Congressional polarization. Dr. Park is also working on several manuscripts including, The Twentieth Century Sectional Reversal: How did the Republican States Switch to the Democrats and Vice Versa? and Is History Repeating Itself? Comparing 1875 to 1928 and 1971 to 2008.